When the Music Man company launched in 1975, led by founder Leo Fender, they introduced a very impressive and respectable line of instruments and amplifier products. These new offerings were updated and re-envisioned by Leo and his design teams. Generally speaking, most of the new instruments and amplifier models were well received, and the debut of the new Fender company was quite impressive. The Sting Ray Bass was one of the new products they introduced. This new bass was Leo’s vision of the “next generation” and logical evolution of a “Fender” bass. The Sting Ray featured many innovative ideas and well-conceived improvements, such as the 3 and 1 headstock arrangement. The Sting Ray was just one of the new Music Man products that professional musicians, artists, and the general buying public whole-heartedly adopted. 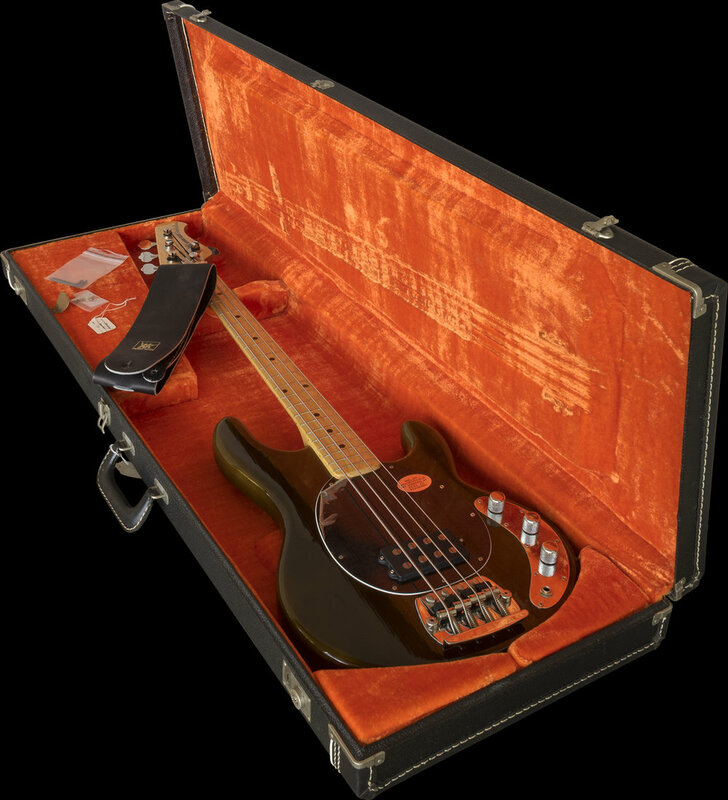 In a fashion similar to what occurred decades earlier in 1951, when Leo introduced the “Precision Bass,” the world’s 1st production Electric Bass Guitar, the Sting Ray Bass quickly garnered a lot of attention. This new Bass had active electronics, which allowed the player to more finely tune and control the tone. The battery-powered preamp had much more gain and fidelity with more low and high-end bandwidth than the more common passive electronic production bass guitars of the day. This approach worked out quite well with the style of bass playing that had been emerging, which included popping and slapping the strings, and most players quickly changed the factory installed Flat-Wound strings for brighter Round Wounds. Almost immediately after it was introduced, the Sting Ray was quickly off and running. It was not unusual for one of Leo’s innovations to define and shape the sound of the music that would follow, and the Sting Ray Bass went on to do so with a unique at that time, “modern,” brighter bass sound, which was relatively new in 1975. The condition of the bass is essentially “New Old Stock.” This is a time-capsule example. There are few very minor marks and evidence of the bass being handled and shop-played or tested when new, but it hasn’t been used. The protective plastic is still installed on the pickguard. The neck has NEVER been removed. I have examined and tested this instrument and found it to be factory-correct and 100% original and unmolested in every way, as well as working correctly. The neck is healthy, and the action is low. The 3 potentiometers are dated 1976 and 1977, and I have installed a new 9v battery. The original Music Man leather strap, case key, and hex adjustable wrenches are still present. The CASE is Original to the Bass and is in matching, excellent condition. The strings are ORIGINAL, these are the Factory Installed Flat-Wounds, and they have never been changed or played. Since their debut, I have been enamored with Leo Fender’s Sting Ray Bass and had always wanted an example for my collection. When I found this one, my search was over. I acquired this NOS Sting Ray about 25 years ago. Since then, I have had it safely stored and have been preserving it. This beautiful bass is now 41 years old and is essentially still NEW. This stunning survivor instrument was finished in the “Walnut” finish option on an Ash body and has a very comfortable and ergonomically shaped Maple neck, which Leo Fender determined was optimal. If you are enamored with the history and importance of Leo Fender basses, then you may want to add this important, game-changing model to Your own Fender collection. Kindly Inquire. Weight: 10 lbs. 11 oz. I also offer Lay-Away terms if this may be helpful to any buyers. I accept payment via Bank Wire Transfer (which garners You a 4% discount) or online payments via PayPal.